Over four million people have taken their lives, attempting to “get there”. What if there’s undeniably prove there’s life after death? Will there indeed be millions of people who abruptly end their present life with the prospect of a better life? Dr. Thomas Harber (Robert Redford) has scientifically proven in this film that there’s an afterlife. He constructed a machine that is able to capture brain wavelengths on a subatomic level when leaving a dead body. The result after this discovery is a wave of suicides worldwide. Only this fact is already subject for many discussions. Is it true people would commit suicide in order to lead a better life? I’m convinced there will be individuals who consider this discovery as the final push to perform such a drastic act. However, this is still a leap in the dark, because where this “consciousness”, “soul” or whatever you want to call it is going, is still unknown. I myself find it fascinating to philosophize about this. Is it a continuation of present life in another era? Or solar system? Is it another dimension? A parallel time line? A rebirth? A flash back or forward in time? That’s what Thomas Harber tries to prove with a newly designed machine, two years after revealing his initial discovery. A sophisticated device capable of recording one’s brain after death. The fact that the images are shown on an ancient looking television and that somehow this footage can be seen on a modern tablet, amazed me. I suppose Dr. Harber also watched the movie “Listening” carefully, because a similar mind-reader device is also used in that movie. An additional point for discussion is whether or not it’s wise to disclose certain scientific discoveries. Especially when there are still important aspects unproved. Here the existence of a life after death is a proven fact, but where it’s leading to is still unknown. With all the consequences this entails. And that’s what Will (Jason Segel), son of Thomas Harber, tries to accomplish. He tries to convince his father to publicly state that his theory wasn’t correct. Most probably that would end the endless number of suicides. He even compares the refuge of his father, a gigantic abandoned youth hostel, with a sect. A place where people who went through some failed suicide attempts, are taken care of. For them it’s a new home where they try to give a new meaning to their life. With the help of an occasional pep talk from Thomas Harber himself. Will meeting the eccentric Isla (Rooney “Her” Mara) on the ferry and getting certain feelings for her, may at first sight be a cheap way to introduce a romantic aspect. But it’s the denouement that makes the puzzle pieces finally fall into place. Strange but true. Although it’s in essence extremely romantic, they still succeeded not to make it a cheesy and corny ending. Besides the rather grandiose performances by Jesse Plemons (as the faithful son) and Rooney Mara, it’s especially the atmosphere that impressed. The images used are a representation of the state of mankind : gloomy, depressing and dark. In other words, the movie won’t make you happy. The empty ferry, the abandoned roads, yet another funeral and last but not least the apathetic residents whose miserable final (drastic) attempt to enjoy a bit of luck again, unfortunately failed. Redford and Segel fit perfectly in this movie, because they were rather dull and colorless as well. 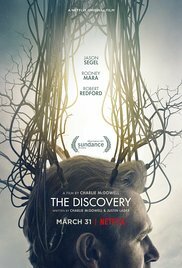 “The discovery” isn’t a cheerful movie, but worthwhile to give it a go. Even if it’s just because of the surprising and hopeful conclusion. Very well done review. I remembered reading another critic’s thoughts on this film and they were similar to yours. Every now and then I like to take in a somber film like this one. Food for thought, I guess.